A pace bowling duo in rhythem and sync is the dream of every team. West Indies and Australia are the leaders in producing menacing duo, while Pakistan leads the Asian challenge. Yet, in today’s world Cricket probably the striker Malinga and disciplined Kulasekara can be considered the most dangerous duo in limited overs World Cricket. Against India, can they defy poor past to hunt as couple!! While the toe-crusher King of Sling Separamadu Lasith Malinga with his wicket-snatching abilities have rightly earned more fame, Kulasekara has been known for accuracy and disciplined bowling even during death overs. Both have, ironically, played 122 ODI matches before the Indian visit in 2012. Separated by just one year, 29-year old Kulasekara and 28-year old Malinga has established themselves as the menacing duo from Sri Lanka. Kulasekara reached the top of the ICC ODI Bowler rating in 2009. Malinga on the other hand, besides his hattricks is the only bowler to have taken 4 wickets in 4 consecutive deliveries. Malinga is also the only bowler to have taken 3 hattricks. Malinga is also the only bowler to have taken 2 World Cup hattricks. Malinga made his debut at Dambulla in 2004 against UAE. An year elder Kulasekara made his debut in 2003 against England at the same venue, Dambulla. Both have appeared in 122 ODIs for Sri Lanka. In 118 innings magical Malinga is just 8 wickets away from 200-mark, having grabbed 192 wickets. Kulasekara, on the other hand, has grabbed 131 wickets in 121 innings. Statistics would establish Malinga as a greater bowler, yet without the menacing act of Kulasekara that forces batsmen to charge other bowlers, Lanka would not have such a better ODI record in the recent past. Malinga, the hattrick man and key striker has taken more than 5 wickets on 5 occasions, with 6/38 being his best. Kulasekara is yet to reach the 5-wkt haul. With 4/40 being his best, he has grabbed 4-wicket haul twice. With bat, Kulasekara is a better down-order batsman. He has scored 879 runs in 80 innings, remaining undefeated on 26 occasions. With 73 as highest, he has scored two half-centuries. Interestingly, lanky Nuwan has also hit 21 sixes. Malinga, despite holding the world record for World’s highest 9th wicket partnership of 132 runs with Mathews against Australia in 2010, and scoring his maiden half-century, is yet to prove worth in demanding batting situation. He has scored 327 runs in 60 innings with 12 sixes. On 17 occasions he has remained unbeaten. Both have been moderate successful against India with Kulasekara having an average of 37.76 while Malinga has poor 42.53. Even their economy is above 5. 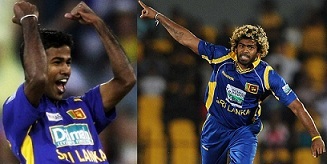 Kulasekara has 38 wickets in 32 innings, while Malinga has 26 wickets in 22 innings of 23 matches. Kulasekara got his best 4/40 against India, while Malinga has never taken more than 2 wickets in an Inning. Both have a poor strike rate also. Kulasekara has 43.1 and Malinga is better with 42.9. Malinga, specially, would prefer to forget the performance against Hobart in 2012. He conceded 96 runs from 7.4 overs getting into the ODI record book as the most EXPENSIVE spell ever. After bowling 5 overs in the first ODI, Kulasekara is ruled out of the series. Kulasekara grabbed a wicket in the 5 overs he bowled, and remained unbeaten on 1 run. Wicketless Malinga was taken to the cleaners again by Indian batsmen who milked 83 runs in his 10 overs. He scord unbeaten 19 runs in the defeat. Is Azharuddin the Best ODI Captain in India Lanka Rivalry!